Juicing is an important part of the Gut and Psychology Syndrome protocol primarily to detoxify and also to provide enzymes, vitamins, and minerals in an easy-to-digest form. Fresh-pressed carrot juice, starting with only a tablespoon or so, is our first introduction of raw vegetables on the GAPS Introduction diet. Up until then, we only consume well-cooked vegetables. Fresh-pressed juice is also important for the GAPS diet because it helps our body detoxify. Why juice and not blends? When we juice, we intentionally take all the fiber out of the vegetable and are just left with easy-to-absorb vitamins, minerals, and other plant compounds. When we blend vegetables up, even with a high-powered blender, we keep the fiber in. Keeping the fiber with our food is normally a good thing- but in the case of detoxification, and healing leaky gut, our goal with juicing is to deliver an the compounds from the plant in an easy-to-digest way. When we are healing leaky gut, our guts are damaged, and our digestion might not be as good at extracting the good stuff from the vegetables as it could be – by juicing, we help this process along. In addition, we like to consume juice on an empty stomach, or just with some water, first thing. This allows our body to quickly absorb what is needed from the juice, without being busy digesting proteins, fiber, or fats. Blending is good, later after your gut is healed more and your digestion is more efficient, using vegetables and fruits in your high-powered blender to make smoothies is a great idea! But for now, in the early stages of gut healing, stick with easy-to-digest juices over blended smoothies. When I started GAPS with my daughter, we were flat-broke. I wanted to do the protocol for her, but I couldn’t afford a $200+ juicer. We started with a Breville centrifugal juicer, and I still recommended this to people starting GAPS that aren’t sure how often they will be using a juicer. This juicer grates/chops the produce as it goes in, and then spins out the juice with centrifugal force. It is a fast juicer, but on the downside, it doesn’t extract nearly as much juice as the Omega or Champion juicers that I will talk about next. I have an Omega juicer now, Champion is a similar juicer. These high-powered juicers extract much more juice (I’d guess nearly double) from the produce using a masticating (like chewing) technology. They are a little slower than the Breville I talked about above, but if you are juicing in large quantities daily as recommended on the GAPS protocol, they are worth it because they get so much more juice out of the produce, especially leafy greens. Another option is to go to a local juice bar and enjoy a ‘shot’ of juice each morning. 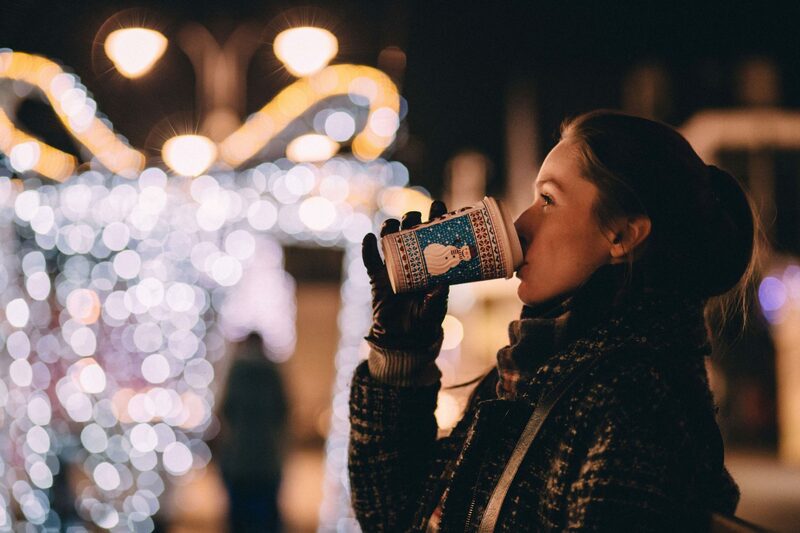 Many health food stores freshly press juice, and if your morning routine had included a trip to the coffee shop previously, you may just be able to take a detour to the health food store or juice bar instead. Make sure they are really ‘juicing’ and not blending, but most places like this make the juice as you watch, so you’ll be able to see what’s going on. 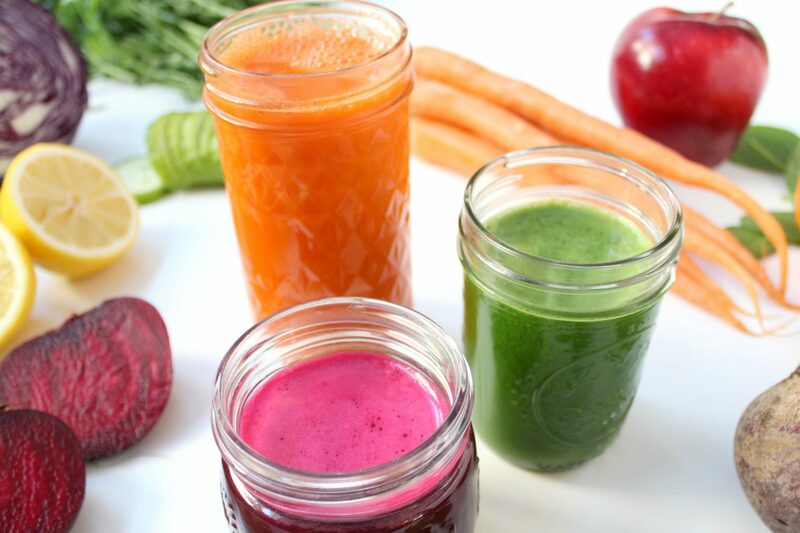 Fresh-pressed juice helps heal leaky gut by providing the body with easy-to-absorb needed plant compounds. These vitamins, minerals, and other compounds in the plants give our body the nutrients it needs to repair itself. The plant compounds in fresh-pressed juice still have all the enzymes intact, and are easily absorbed from our gut into our blood stream for our body’s immediate use. We talked about plant compounds and how it’s more than just vitamins and minerals present in the food that we use in this post about ginger tea, this post about herbed olive oil, and this post about fruit juices as medicine. Because most of our detoxification system is in our gut, many people with leaky gut will have a hard time detoxifying everyday toxins from the environment. Juicing helps with this, as the compounds (I call them plant chemicals, which is what they are) in the juice bind to toxins, especially heavy metals, and allow them to be extracted from the body. Since the majority of our detoxification system is in our digestive tract, people with leaky gut often have a hard time detoxifying from normal exposures to toxins in our environment. Juicing helps this process along, especially on an empty stomach. People with a healthy gut and good detoxification system are able to easily process out the normal everyday toxins – toxins come from everything in our environment. But when our gut is leaky, we can’t process the toxins so they build up. It can be from something as sight as perfumes as you sit in church or a little bit of heavy metal in dust as it’s blown around on a windy day, or something as intense as having metal fillings or accidental overexposure. These toxins build up in our gut, and can cause our gut to be leaky. This results in kind of a ‘chicken or the egg scenario’. Did leaky gut cause buildup of toxins, or did excess toxins cause leaky gut? In any case, juicing helps bind to those toxins for easy removal, as well as provide nutrients needed to repair leaky gut. In the Gut and Psychology Syndrome protocol, juicing is introduced in stage 4. In my 30-Day GAPS Intro Guide, we start this on day 17. Juice is to be consumed fresh-pressed, and in the morning on an empty stomach. This allows our body to easily absorb the nutrients from the juice, without anything else in our digestive tract getting in the way. 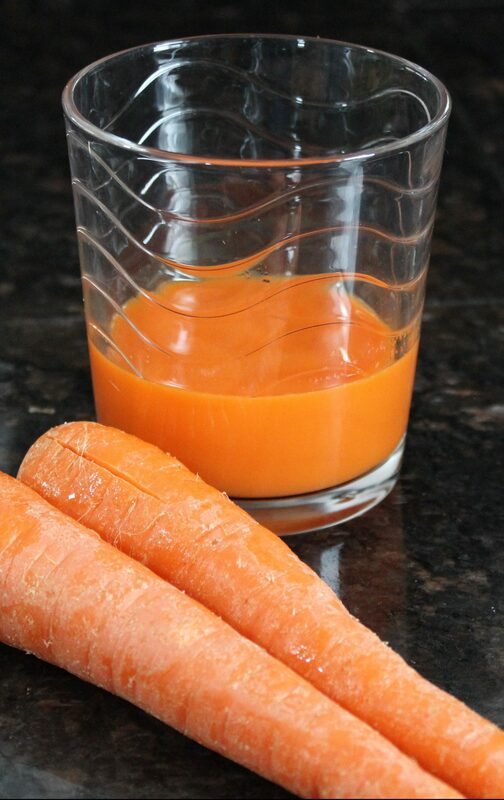 We start with 2 tablespoons of carrot juice, and try that for a few mornings, checking and noting any reaction. 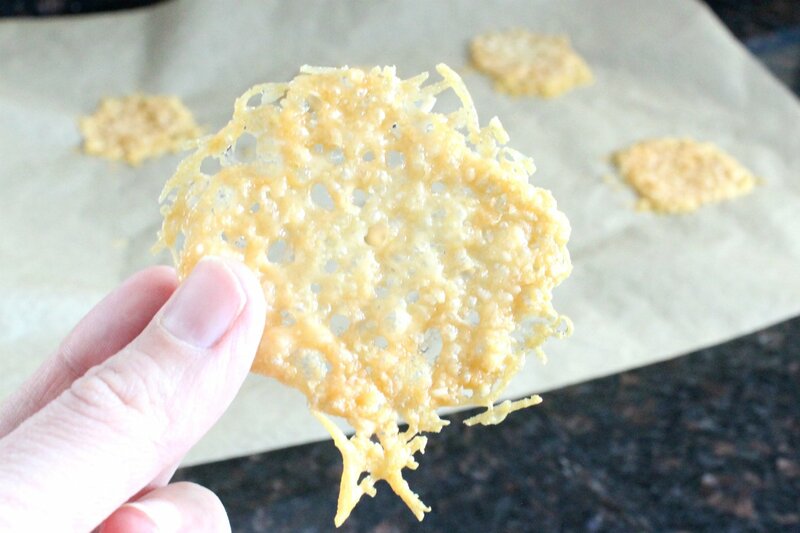 This is one of the first raw vegetables that we introduce, and sometimes our digestive system isn’t ready for it. If you have a poor reaction, you have two choices- you can either try a different vegetable (this is recommended if you had a sensitivity to carrots prior to GAPS) or you can stop the juice and try again in a week or so. As you tolerate carrot juice, you increase the quantity and variety to include leafy greens, herbs, and as you introduce fruit, you can include small amounts of fruit in the juice as well. As you go through the GAPS protocol, even after the introduction phase, you are encouraged to continue drinking a glass of fresh-pressed juice first thing every morning. Pineapple, carrot, and beet help with digestion and stimulate stomach acid. Apple, celery, beet for liver cleansing. Green juices with leafy greens, parsley, dill, carrot and beet tops with tomato and lemon for chelating and rich in magnesium and iron. Cabbage, apple, and celery stimulates digestion and cleanses the kidneys. Beets are recommended at no-more than 5% of the total juice due to their sugar content. 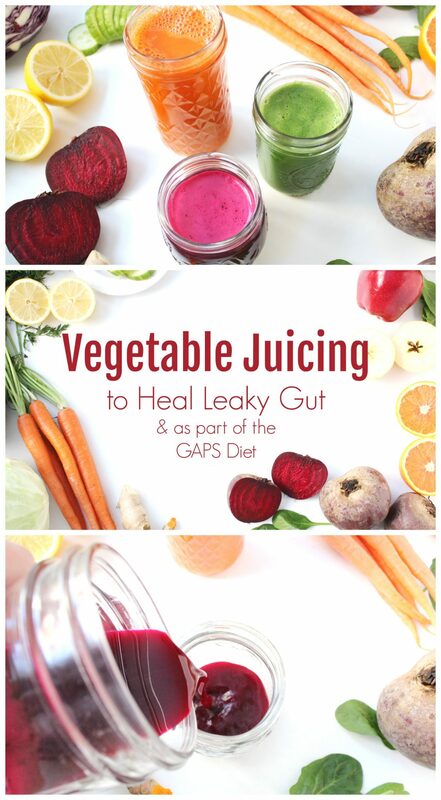 We talk more about the GAPS Juicing Protocol in my Gut-Healing Starter Pack, which you can find here. The Gut-Healing Starter Pack is based on the GAPS and Specific Carbohydrate Diet, but it also has optional gut-healthy modifications for those who don’t want to commit to the entire GAPS Diet as well. Many people find that carrots are irritating to their digestive system, especially causing gas or bloating, so they might not be able to tolerate carrot juice. If this is the case for you, I recommend trying the same protocol but with cucumber juice. Cucumber juice is also naturally mild and sweet, but it tends to be less irritating than carrot. The dark leafy greens might be too strong and trigger too much of a healing crisis for starting with, but as you tolerate cucumber juice you may be able to start adding greens as desired. Some people will ask me if they can take Juice Plus instead of juicing. And I’m just going to say, ‘no’ without going into it much more. 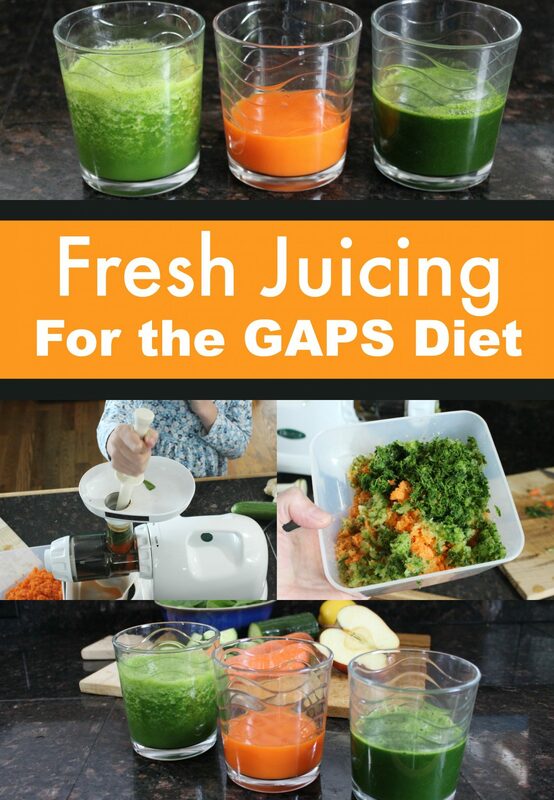 Of course you are an adult, and you are in charge of your body and you can do whatever you want, but… the GAPS Diet protocol uses fresh juice from real plants. If I remember correctly, Juice Plus was also using folic acid in their supplement, which is something else people with leaky gut need to avoid (read more here). In short, Juice Plus is a supplement, and does not count as juicing. Juicing is a popular health-giving food, for all the reasons outlined above. If you’ve been curious to give it a try, even if you’re not on the GAPS protocol, fresh-pressed juice in the morning on an empty stomach can give a great boost of easy-to-digest nutrition to anybody. Just a practical tip…you can often pick up a good juicer used for a significant discounted price. They are one of those items people often buy with good intent and then find they never use it. I purchased a sturdy Champion juicer for $60 on craigslist and have been so happy with it. That’s a great tip Andrea! Hi Betty, beet is so good for you that it would be a great addition to your diet. Beet powder won’t have the fresh enzymes and may lose some of the plant chemicals as well, so it’s best to juice fresh. How do I know if my body is tolerating carrot juice well? I’m in stage 4 and have been juicing for about a week and I’m at almost 1 cup per day. Thanks! How do you feel? Have you been using a symptom tracker at all? I have one here if you need it- you’ll usually see patterns when you introduce things and can tell if it’s working for you or not.